Sometimes gamers would just like to have a ready-built gaming PC setup that is powerful and able to play just any games they want in one single purchase. While piece by piece buying their preferred gaming peripherals and modules and customizing its power to their liking, it is from time to time much more convenient to just buy everything at once and start playing those games especially if the budget is not in question. 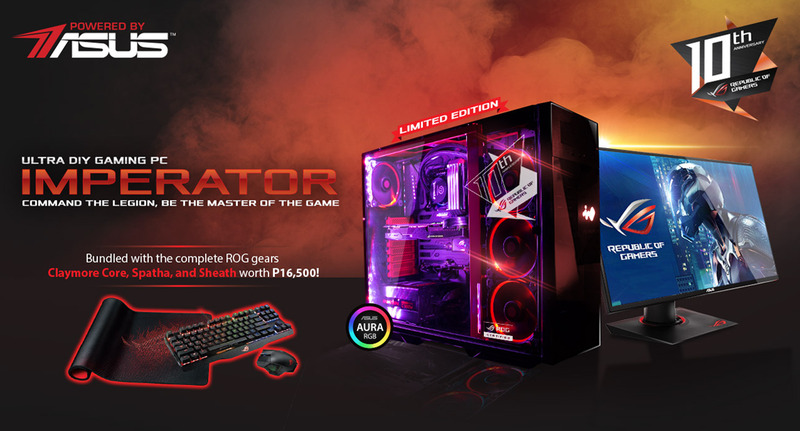 Well, for that matter, ASUS has an overkill bundle for them, and its the newly launched ASUS ROG Imperator. The ultimate DIY gaming PC bundled with the best ROG peripherals and components available on the market right now for Php184,900 a pop. ASUS ROG Imperator Ultra Gaming DIY PC is what it's called and is launched as part of Asus Republic of Gamers (ROG)'s 10 anniversary. And as what you can already guess, this a complete package of different high-end PC parts for gaming that you will be able to assemble yourself. Holding most of the peripherals is the powerful and flagship ASUS Maximus VIII Formula Z170 ATX motherboard for superior cooling , performance and aesthetics. Alongside it are the overclock-ready Intel Core i7-6700K processor, 16GB DDR4 RAM and a top-of-the-line ASUS ROG Strix GTX 1080 GPU. Those three already guarantee your smooth and lagless gaming experience in full blast settings. As for its built-in storage sizes, you will be happy to know that the ROG Imperator bundle comes with 240GB SSD and a staggering 2TB HDD right out of the box. One of nicest things you can also get out of this ultimate gaming setup from Asus is the Philippine-exclusive In Win 509 10th Anniversary Edition casing. As for display, buyers will get the ROG Swift PG279Q that sports an IPS Panel with resolution up to 2560 x 1140. G-Sync module with 165 Hz native refresh rate are also onboard. Additionally, upon purchase free peripherals worth Php16,500 will be given as well such as the ROG Claymore Core RGB Mechanical keyboard, ROG Spatha mouse, and ROG Sheath mousemat. The ASUS ROG Imperator Ultra Gaming DIY PC is now available at Asus store partners in the Philippines for Php184,900. For orders you may visit or contact Complink, Concept Computers Iloilo, Davao Futurebright Enterprises, Dynaquest, Gaisano Interpace Cebu, JDM, Octagon, PC Express, PC Hub, PC Worx, Thinking Tools, PC QuickBuys, and Villman.